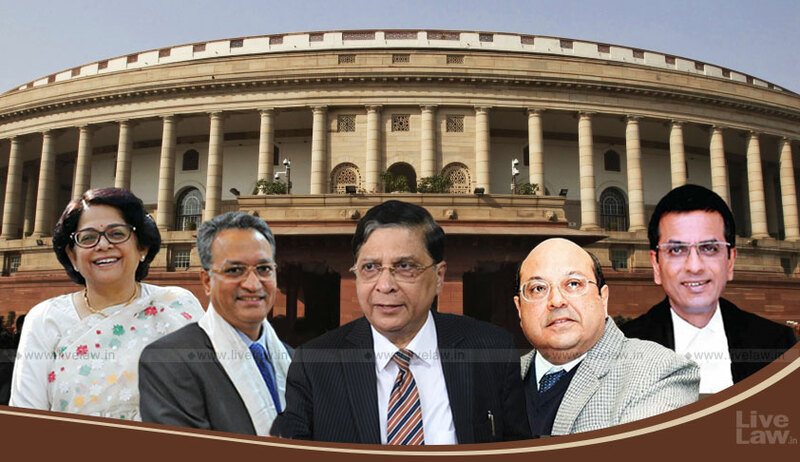 "We recommend to the Parliament to bring out a strong law whereby it is mandatory for the political parties to revoke membership of persons against whom charges are framed in heinous and grievous offences and not to set up such persons in elections",CJI Misra in the judgment. The Constitution Bench of the Supreme Court issued a slew directions today with the objective to reducing criminalization of politics, though it chose to refrain from declaring that framing of charges in criminal cases will disqualify one from contesting elections, owing to Constitutional limitation on the Court to enter legislative domain. "A voter is entitled to have an informed choice", said Chief Justice Dipak Misra in the judgment written for the Constitution Bench. The Constitution Bench extrapolated the earlier directions issued by the Court in People’s Union for Civil Liberties v. Union of India and Union of India v. Association for Democratic Reforms regarding furnishing of information by candidates. Disclosure of antecedents makes the election a fair one and the exercise of the right of voting by the electorate also gets sanctified. For democracy to survive, it is essential that the best available men should be chosen as the people‘s representatives for the proper governance of the country. The best available people, as is expected by the democratic system, should not have criminal antecedents and the voters have a right to know about their antecedents, assets and other aspects. The Court referred to the 244th report of the Law Commission of India, submitted in February 2014,recommending that candidates against whom charges are framed for offences punishable with imprisonment of five years or more should be disqualified from contesting elections, and holding seats, if the framing of charges happens after the election.The Commission headed by Justice A P Shah, former Chief Justice of Delhi High Court noted that in the current Lok Sabha, 30% or 162 sitting MPs have criminal cases pending against them, of which about half, i.e., 76 have serious criminal cases. The Commission also observed that some States have a much higher percentage of MLAs with criminal records: in Uttar Pradesh, 47% of MLAs have criminal cases pending and a number of these MPs and MLAs have been accused of multiple counts of criminal charges, for example, in a constituency of Uttar Pradesh, the MLA has 36 criminal cases pending including 14 cases relating to murder. As per the Commission, it is clear from this data that about one-third of the elected candidates at the Parliament and State Assembly levels in India have some form of criminal taint. The Commission stated that criminal trials of cases against politicians were not taking place in a timely manner, and thus, criminal politicians are getting benefited out of systemic delays. In view of the startling proportion of persons with criminal charges entering public life, the Commission made the recommendation that framing of charges by Court should constitute disqualification. While making this recommendation, the Commission consciously ruled out other two stages for triggering disqualification- filing of charge sheet and taking of cognizance by Court. The Commission concluded that since the stage of framing of charges is based on substantial level of judicial scrutiny, a totally frivolous charge will not stand such scrutiny and therefore, given the concern of criminalisation of politics in India, disqualification at the stage of framing of charges is justified having substantial attendant legal safeguards to prevent misuse. "...the prescription as regards disqualification is complete is in view of the language employed in Section 7(b) read with Sections 8 to 10A of the (Representation of Peoples) Act. It is clear as noon day and there is no ambiguity.The legislature has very clearly enumerated the grounds for disqualification and the language of the said provision leaves no room for any new ground to be added or introduced". The petitioners advanced an alternate submission that the Election Commission of India can be directed by the Court to act against political parties who field candidates with criminal background. It was submitted that the Election Commission can be directed to (a) deregister a political party, (b) refuse renewal of a political party or (c) to not register a political party if they associate themselves with persons who are merely charged with offences. It was also suggested that a candidate against whom criminal charges have been framed in respect of heinous and grievous offences should not be allowed to contest with the symbol of the party. However, the Court held that issuing such directions would t would tantamount to adding a new ground for disqualification which is beyond the pale of the judicial arm of the State. "Any attempt to the contrary will be a colourable exercise of judicial power for it is axiomatic that ―what cannot be done directly ought not to be done indirectly‖ which is a well-accepted principle in the Indian judiciary", said the Court. The Court repeatedly highlighted the need for a parliamentary legislation to address the menace. The Court recommended the Parliament "to bring out a strong law whereby it is mandatory for the political parties to revoke membership of persons against whom charges are framed in heinous and grievous offences and not to set up such persons in elections"
"A time has come that the Parliament must make law to ensure that persons facing serious criminal cases do not enter into the political stream. It is one thing to take cover under the presumption of innocence of the accused but it is equally imperative that persons who enter public life and participate in law making should be above any kind of serious criminal allegation. It is true that false cases are foisted on prospective candidates, but the same can be addressed by the Parliament through appropriate legislation. The nation eagerly waits for such legislation, for the society has a legitimate expectation to be governed by proper constitutional governance".